As we get closer to the 2019 legislative session, the debate over taxes and government spending is going to heat up. Specifically, we can expect a stronger push for ENDOW and its WyoFlot project, with both being pushed as instruments for jobs creation. How do higher taxes, and a state corporate income tax, help businesses create more jobs in Wyoming? While we wait for their answer, let us have a look at the current jobs situation in our state. According to the latest jobs figures from the Bureau of Labor Statistics (BLS), private-sector employers had 6,700 more employees in September of this year than they had in September 2017. At 224,500 employees, the privately employed workforce is smaller than it was in 2008, but less than 4,000 jobs away from 2015. Wyoming lost some 17,000 private-sector jobs from 2014 to 2016; so far we have recovered less than half of that. That said, the private sector has been adding jobs, year over year, for 14 months now, at a pace that has exceeded three percent for four months in a row. This is a good trend. It is a frail trend but it is nevertheless good. If anyone should feel so inclined, the best way to put an end to it is to raise taxes and impose new ones, such as a corporate income tax. That would guarantee to bring this jobs-creation trend to a grinding halt. Of course, the proponents of ENDOW and WyoFlot will tell us that this is precisely why we need more corporate welfare. They will tell us that when they raise taxes to be able to pay for ENDOW and WyoFlot (the airline alone will run deep into the tens of millions of dollars per year) it will obviously make it harder for businesses to create jobs. Therefore, they will tell us, we need ENDOW and WyoFlot so that the private sector can re-create the jobs lost to the higher taxes. There are 12,600 fewer workers in private employment in Wyoming today than there were ten years ago. Percentage-wise, at -5.3 percent, this is the worst jobs record of all the 50 states. Not even West Virginia falls to the same depth as we do. At the same time, Utah forges ahead, even beating North Dakota and the Texas growth machine to the top spot. As a matter of fact, these are the three states that saw 20+ percent private job growth over the past ten years. 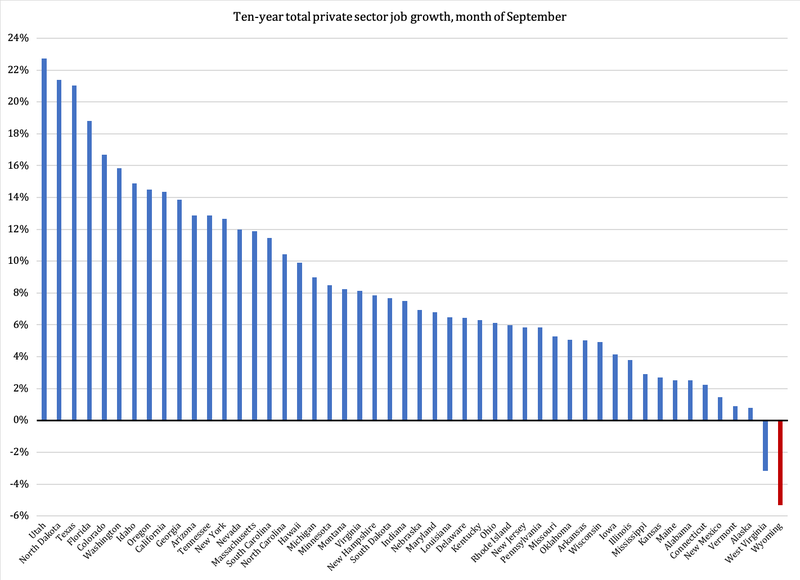 A total of 17 states have seen jobs grow by more than ten percent over that period of time. Why are we not in the same category? After all, North Dakota and Alaska experienced jobs growth in the private sector (although, in fairness, the Frontier State's growth rate was only 0.8 percent). South Dakota, a state as rural as ours - even accounting for federal lands - had 7.7 percent more private-sector jobs in September 2018 than they had a decade earlier. We are mediocre, at best, in overall business-friendliness. In reality, the big problem with our workforce is not the workforce, but - you guessed it - big government. How easy is it for a private employer to compete with government for workers, when government can artificially inflate its workforce compensation by simply spending more tax dollars? The GER in Wyoming currently stands at 274; we have had the highest ratio of all states since at least 2007. Our nearest competitors for the top spot in the hall of shame, Alaska and New Mexico, continue to trade places with one another; currently, the Alaskan GER is 256 while New Mexico scores 241. Mississippi comes in a close fourth at 239, followed by Oklahoma at 224. 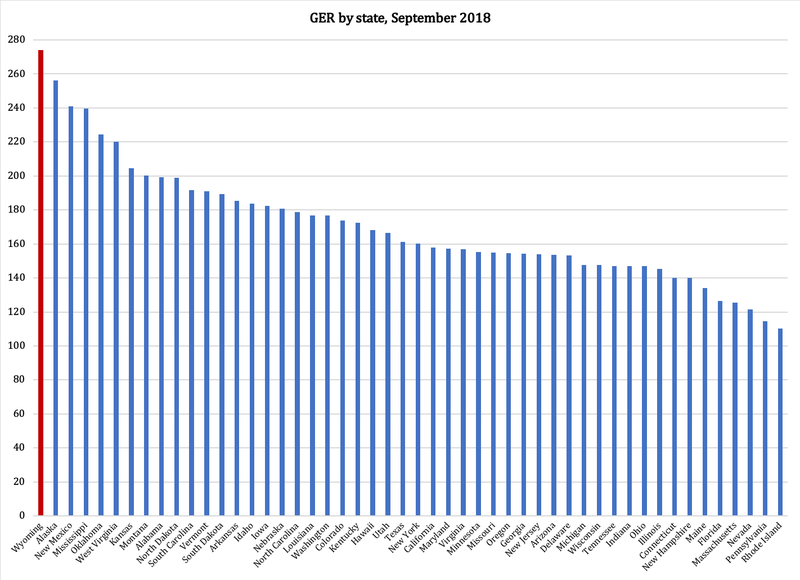 At the other end of the scale, Rhode Island maintains the lowest GER of all states, 110. at 115, Pennsylvania has the second-lowest ratio, followed by Nevada (122), and Massachusetts and Florida (126). An often-heard argument in defense of Wyoming's high GER is that we need it because we are a rural state. This presumes that there is some sort of fixed cost in providing government services, a claim that has never been substantiated by any proponents of our big government. 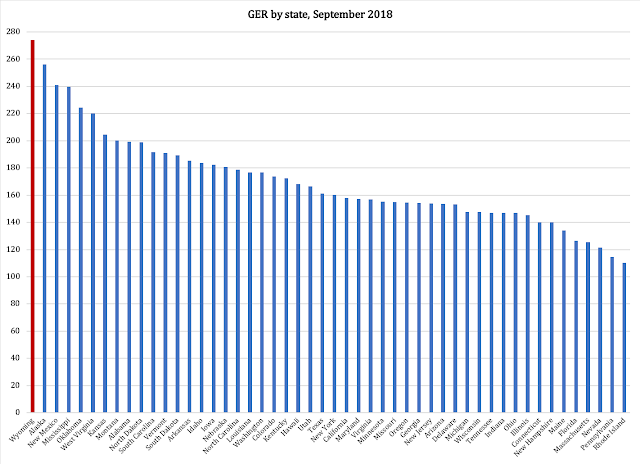 But while we are waiting for them to deliver on that, let us note that the Dakotas score 189 (South) and 199 (North), and, again, Alaska - by far the most rural of all 50 states - has a lower GER than we do. If there were any truth to the idea that the size of the government workforce stood in some proportion to population density, Alaska's GER should be several times higher than ours. Speaking of Alaska, bear in mind that they do not even have a state-covering highway network. Their state capitol is isolated and can only be reached by boat or airline; places like Wales, Nome or Savoonga are inaccessible except by air transport. Yet somehow the Alaskans get by with a smaller government than we have, and without a state-run airline. In conclusion, we have a slow-growing private sector, a government that stands in the way of private-sector growth, and no room for higher taxes. There is no room in the Wyoming economy for tax-paid "economic development", ENDOW or WyoFlot. We could make some headway toward a lighter government with efficiency reform, but it would have to be a real reform, not the kind that costs taxpayers more money, and it would only be the first step; the big gains are in structural reforms to regulations and spending. There is more to be said about jobs in Wyoming. Stay tuned.